I'm a little embarrassed to admit that, if you don't count Mad Magazine, Essex County is the first graphic novel I have ever read. I knew full well that there was a world of difference between graphic novels and comic books, and that there are many acclaimed graphic novels gracing the shelves of serious bookworms, but I somehow still carried the BIFF, BAM, POW prejudice within my psyche. And that may be why I was so taken with Essex County. It's a stunningly beautiful book, comprised of three interwoven stories that explore alienation, family, love, loss, and betrayal in a southern Ontario farming community over the decades. An orphaned boy who wears the shield of a superhero, two hockey hero brothers torn asunder by secrets, a public health nurse whose entire life is the community are the rich characters who are depicted so strikingly within the novel. I took my time reading this book. I wanted to savour the experience, to give this haunting book the full attention it deserves. I found myself pouring over the black and white artwork, marveling at the emotions that Jeff Lemire brings to the faces of the characters with just a few lines. Their eyes in particular speak volumes, while the people themselves are largely silent. Lemire manipulates perspective and space so masterfully in his drawings that you can't help but get lost in them. From the intimacy of facial closeups to the staggeringly open spaces of his large panels, Lemire tells an incredible story with a few strokes of the pen and a handful of words. The large panels, of field and sky and forest and staircases, are especially striking. They often function as scene changers, but they are so much more than just place markers; at times I was overwhelmed by the sheer power of these enormously silent panels. 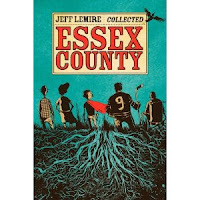 Essex County is one of the novels battling for this year's Canada Reads championship, the first graphic novel ever to be included in the competition. It will be championed by Sara Quinn and (fun fact!) came to be on the Canada Reads list via a nomination by our very own book meister. My copy of Essex County fell into my hands via the thoughtfulness of my very dear friend, who sends me wonderful things. I owe him enormously for this. 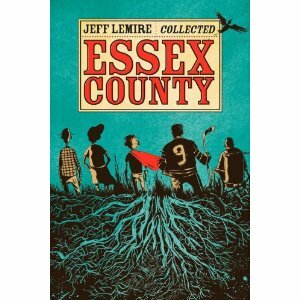 Essex County is a poignant novel, which leaves you deeply wistful after the last page is turned. But within the poignancy there is profound beauty. I know I will be opening those pages again and again to return to Essex County. Huge sigh of relief and a smile that you liked this one!!! Somehow or another I've failed to explore the world of the graphic novel. I did read one some years ago. It was a gift and I liked it. I don't know why I haven't read more. I'll have to remedy that. They have used graphic novels in our school in the English program for a couple of years now - they are quite a hit with the kids. It was a wonderful book, John, and I wholeheartedly back your nomination for Canada Reads. Perhaps they just aren't really on your literary radar, Mr Anchovy. That's certainly the case with me. Very glad I read this one, though. I'll bet they are, Kathy. They are very accessible and the combination of visuals with few words would be really appealing to that age group. I've skimmed graphic novels, but I've never really taken the time to sit down and read one fully. I will have to check this out, now that it has 2 solid recommends from both you and John. I think the geographic setting of Essex County will appeal to you greatly as well, Al. Love, love, love this book... Affections really starting to spread methinks as well as buzz continues to grow. Terrific review here too Barbara. So glad you loved this one. I can't wait for his next! It's a beautiful book, Sean and a very thoughtful gift. Thank you. I hope Lemire brings some of those characters back in his next book; I worry about them. Maybe now you'll subscribe to my graphic novel.